I've had a lot of LPC tilesets in various states of flux on my hard drive for a long time now. 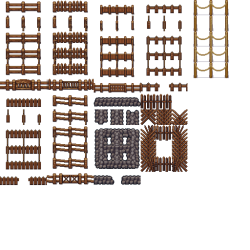 I've realized it takes me probably too long to get them out there, so I was inspired by Zabin to start this thread and post some of my WIP tilesets. Hopefully I can get feedback and prioritize sets to finish. I know AntumDeluge is working on converting a lot of assets for Stendhal, so hopefully I can also try to target things I'm already working on to his needs. 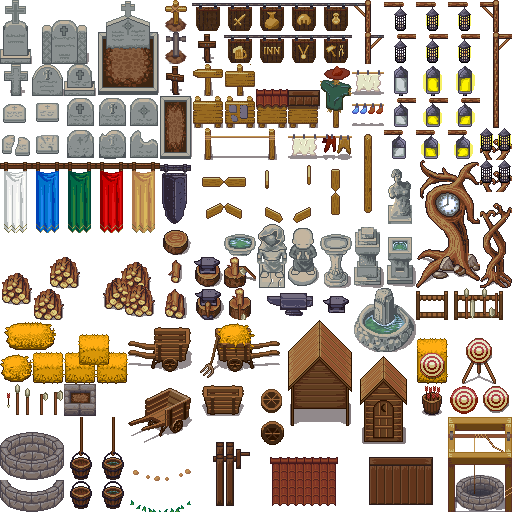 My interest (for some reason) is in creating thematic compilations of related assets, then filling in the gaps with similar-styled art, or remixing pieces that are already included. For this reason, all the images in this thread likely include multiple other contributors work, and should not be used until I have had a chance to properly attribute them. Don't download images from this thread and use them! 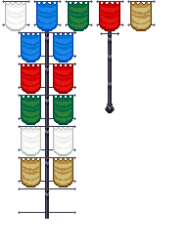 In light of the whole situation with Hyptosis' lantern, I've been trying to finish some "town decorations"---stuff that would be around a town/village (other than major buildings). 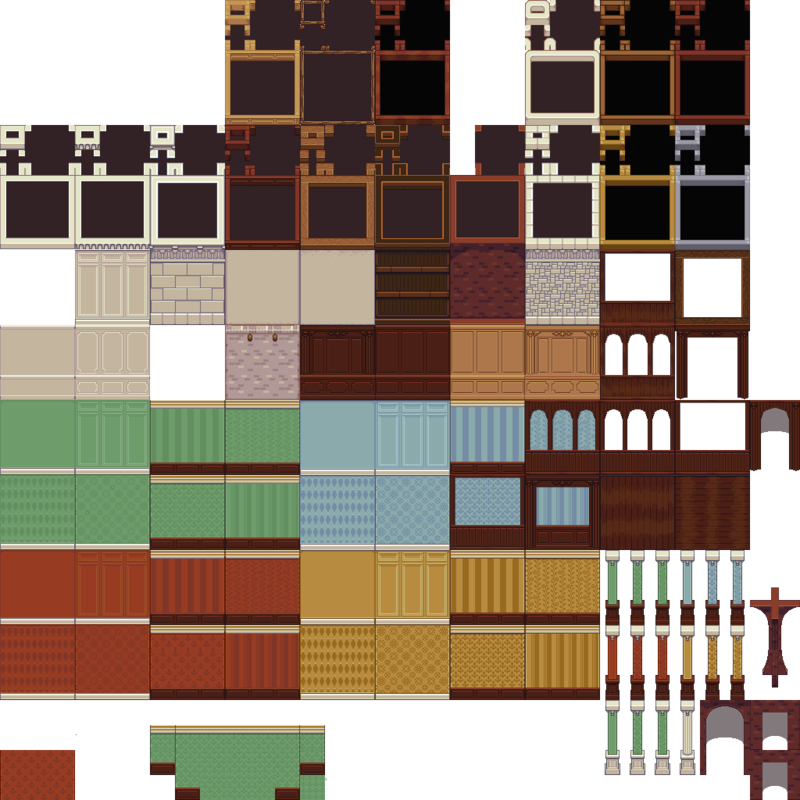 I've been working on two settings: medieval and victorian (with an eye towards steampunk for the latter). The goal is for the two sets to be usable together as well, for some settings. Victorian is probably 80% done. I want to tidy up some of the glass, finish making some wrought iron furniture, and add some arbors/pergolas/trellises. I tried making a Paris-inspired newsstand, but was never able to get it to look good... may come back to that at some point. Along with those two are some fences, same pair of styles. No critique here-- these look amazing, BlueCarrot! I'm looking forward to building off of them, when they're ready! Game Project: http://theLastScore.com - Retro-ish 2d apocalypse base-builder. These are looking great bluecarrot16! Can't wait for release. 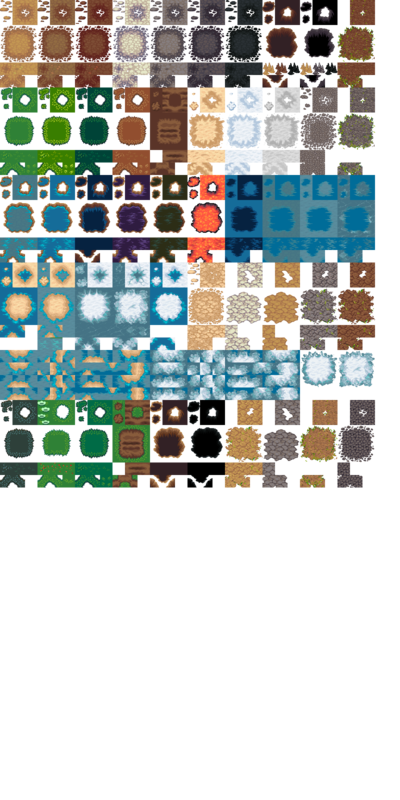 I want to suggest some snow-covered tilesets, especially of tiles such as wood stacks, logs, trees, firewood, or campfires. Outdoors stuff. Definitely! 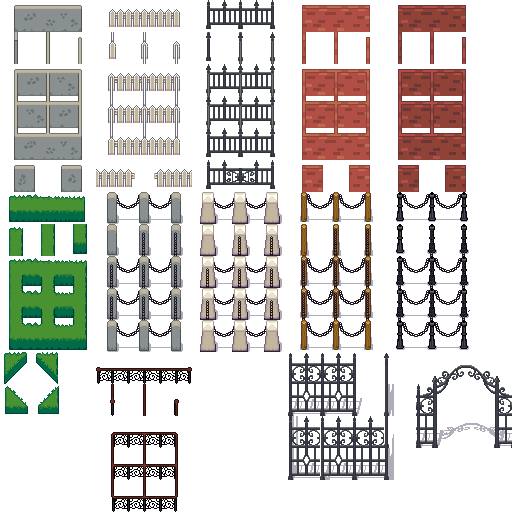 Do you think it makes more sense to make a seasonal variant of an entire tileset (like, make a version of these tilesets where everything is covered in snow), or to just makea separate snowy tileset? The latter probably makes more (or just as much) sense for an RPG or MORPG like Stendhal, but the former would be more practical for a game with Harvest Moon/Stardew Valley-style seasonal progression. This is great. Can't wait for these to be officially submitted. 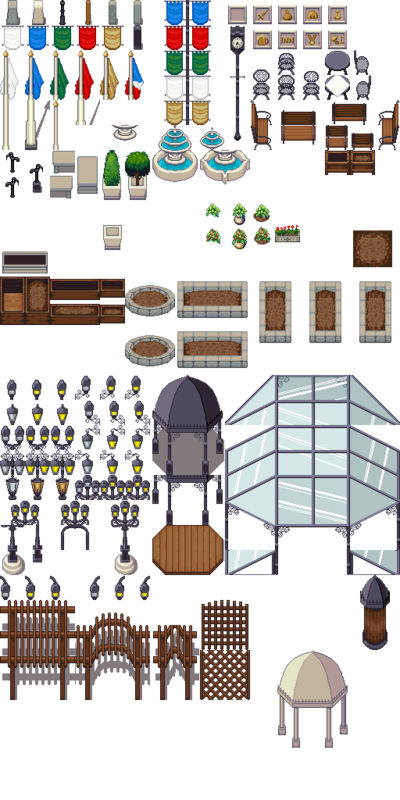 Having separate copies of tileset for each season would be amazing, but I have doubts the extra work is worth the effort. I feel like it's only fully effective if you have 3 new versions of every terrain and outdoor decoration tile in the whole LPC set. A seasonal variant is about 75% as good, but at least 4 times less work. 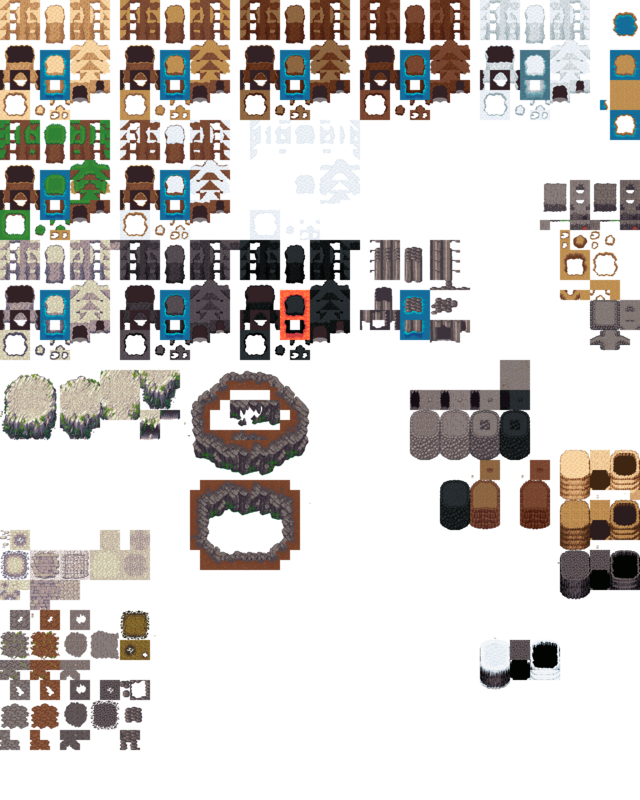 I think a separate tileset would be much simpler. 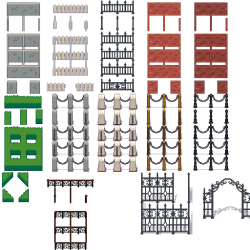 Like MedicineStorm says, snowy variants of each tileset would be great. But would probably be too much work. Might be better saved for a long-term goal. Well... not necessarily. Snow covers a _lot_ of terrains. We already have an ice tileset for water. We could just impose patchy-snow bits with transparancy over the others? Then you'd just need a brownish-gray, dry grass. As for the assets... A full, complete, wide-encompassing set would have all seasons for the plants, but snowy variations of the others. Eventually I'd like to make front / side / back views of as much as I can, so items can be rotated and placed, like a base-builder. It's one of my own art goals, anyway. Ooh! Transparent overlays. That would be awesome. Yeah, I was imagining a snowed-on and non-snowed-on version of the outdoor stuff. 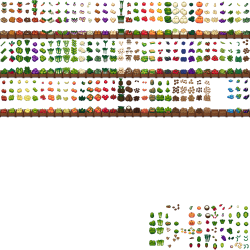 I think the only stuff that might need 4 variants would be plants, and even then spring/summer can look pretty much the same for a lot of stuff. Even just green/brown/dead/snowed-covered would be plenty. Eliza, I'm trying to make 4 rotated versions of everything that makes sense. 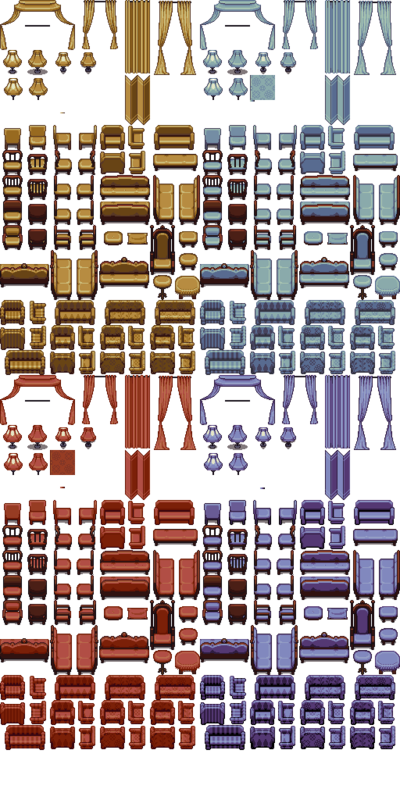 Here are the furniture sheets I've been working on. 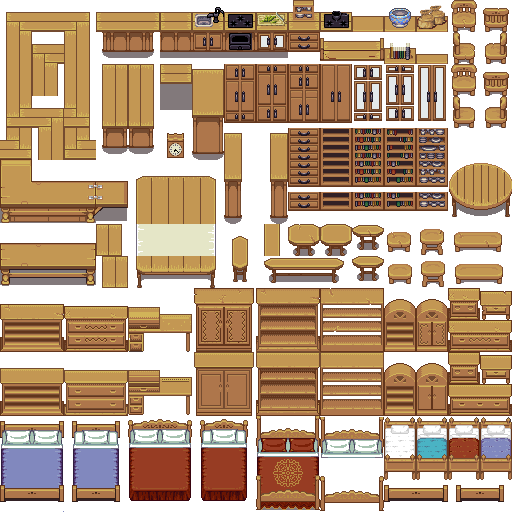 Still need to do the dressers and beds (I was trying to fit everything in 512x512, but doesn't look like that's gonna happen, so might as well go all out and do all rotated versions of everything). Actually, maybe you could help me with some color ramps for the "upholstery" one (I know you made a bunch for your clothing sets)... I don't really like the ones I've made, other than yellow. I also plan to move the bed sheets to the upholstery sheet and make a blonde variation of the whole "dark-wood" tilset (the blonde version I uploaded is recolored from an older version of the dark-wood one). Any other ideas for interior wooden furniture? Wow bluecarrot16, those are looking amazing! I don't remember ever seeing the middle piano or organ before. Did you create those using left (baby grand) piano? Sofas! All the sofas! Oh, that's amazing. I'm really loving where you're taking this! I'm guessing that's a walnut and pine variation for the wood? That's a really solid base to start with. I'm also really excited to see more furnishing positions, though-- it's great to hear you mean to expand it that way. You're doing an amazing job. 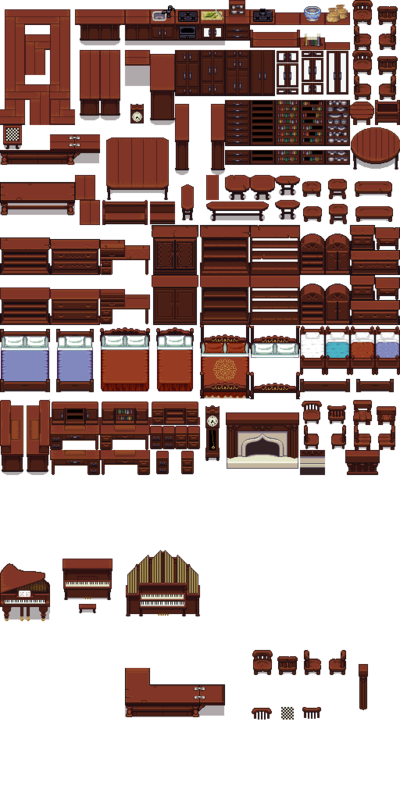 @AntumDeluge, Yep, the two keyboards on the right are derivatives of Reemax's piano on the left and Sharm's counters on the top. @ElizaWy, I wasn't thinking of any particular type of wood, just the colors. 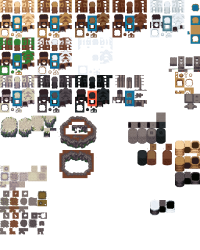 I tried to group things that were predominantly wood into the same set so they could easily be recolored. I'll probably do a white version too, then leave it up to others if they wanted to recolor further. Quick update: got a bit distracted from decorations this weekend and have mostly been working on cliffs/mountains. Now that Zabin's main ZRPG set with the rocks is out, I'm inspired to churn this one out :) Probably 85% done (I did a lot of tidying and throwing away stuff that wasn't working), mostly just need to finish organizing things and tidying up. 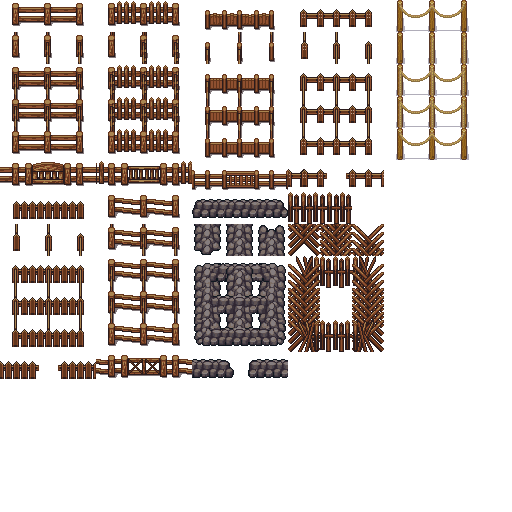 I've also been working on a general "terrain" tileset that I hope to release at the same time, along with a Tiled file so it can be easily used. Making progress on the Victorian set though! I just want to fill the planters with some variations from my plants set. Any other ideas? I'm also okay leaving some extra space to fill in later. 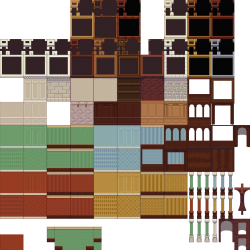 Alright, the Victorian town pieces are coming together! Had to make the sheet a tiny bit bigger, so I'm leaving some extra space for future expansion. 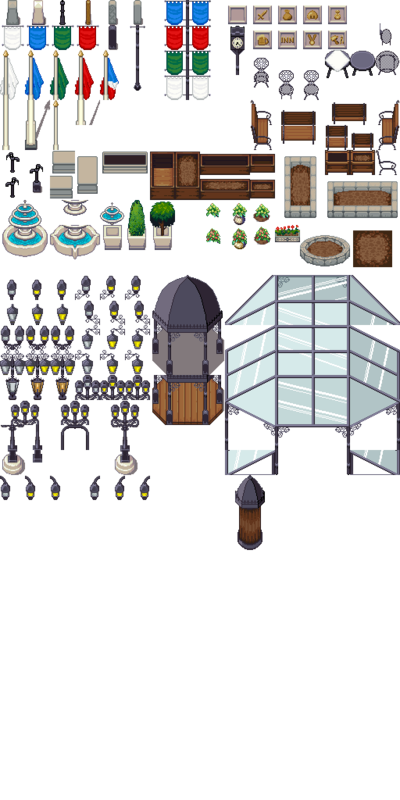 Main thing to finish now is the planters, and need to decide if I'm gonna add a bunch of stuff to the market stalls, news stands, etc. or leave that for later... Hmmm... Also time to start working on a preview! Jeez bluecarrot16, you must be working your fingers to the bone! Edit: Oooh! I'm excited about the hanging banners too. Got a couple of those that need replaced in Stendhal. Since you mentioned those two things, you can go ahead and use them. The banners are based on LPC Street Lamp https://opengameart.org/content/lpc-street-lamp by Curt & Sharm (CC-BY 3.0) and Caspar Nilsson's LPC Entry https://opengameart.org/content/lpc-cnilsson (CC-BY-SA 3.0 / GPL v3). Consider my edits CC0. The window flower boxes are from Caspar Nilsson's LPC Entry https://opengameart.org/content/lpc-cnilsson (CC-BY-SA 3.0 / GPL v3). Consider my edits CC0 as well. Well I know I still haven't gotten around to finishing the victorian or medieval sets. 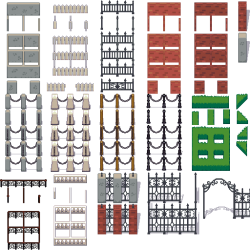 I'm working on colonial and victorian building sets to go with them, and I've been holding off on submitting until I can make a nice preview... and I've been delaying THAT until I get my terrains sorted out. I think I'm pretty much happy with the terrains set---the idea is to have a smaller set which is fairly comprehensive and then a larger set which includes some extensions. I've attached the larger set, but the smaller set would just be cut off below the sand/water and snow/ice combinations (e.g. 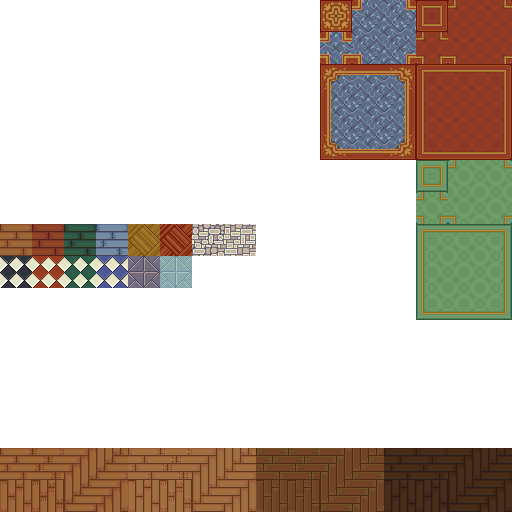 at 32x32 instead of 32x64 tiles. 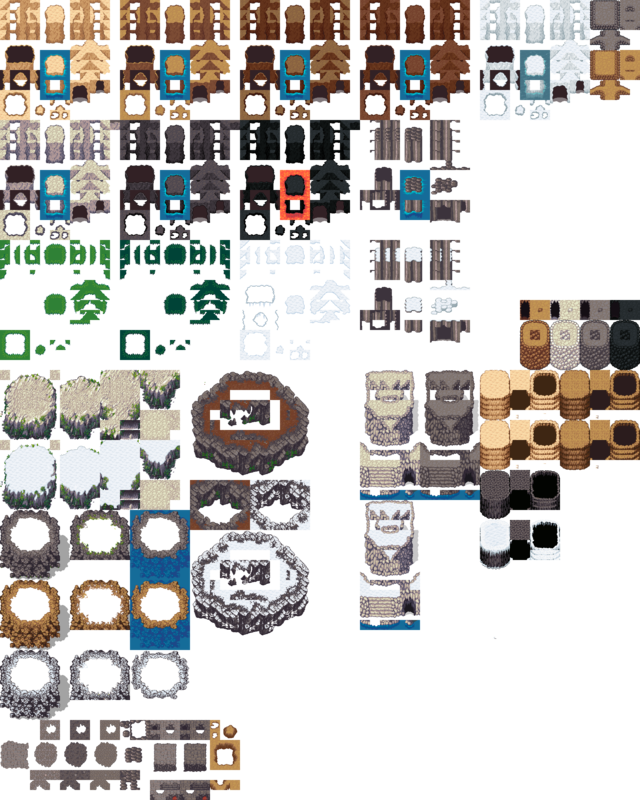 I've also been working on using the Tiled terraingenerator to make a massive sheet with a curated set of combinations of overlapping tiles. I don't think it makes sense to have lava and grass and snow all in the same tile, but it probably makes sense to have grass, sand, and dirt... etc. As for mountains, those are probably 95% done. I'm interested in feedback here on how to handle snow and grass overlays. I've made snow overlays for most of the mountain/cliff styles (seen here). Similar to our discussion above, does it make sense to have a separate sheet containing all the mountain/cliff style varieties, but snowed on? Or would it be better to have both snowed-on and non-snowed on versions in the same set? Some combination? Let me know what you think! 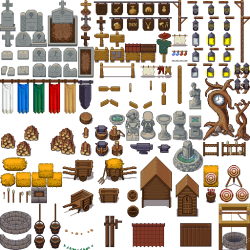 I've contacted Saphy about her contributions in The Mana World Forest tileset and secured CC-BY 3.0 I have not been able to contact Len though... I've tried many times and different ways. It's a shame because I know his answer would be "yes!" seeing most his art here is dual licensed. So you'll have to release that seperately. That is an amazing collection. I like what you did to the lost garden mountain tileset. Good job! So far, added one of the banners to Stendhal. Thank you bluecarrot16. yeah 6 years on this is still amazing, for programmers like me with no art skills! Thaanks for the wonderful free art !! Can I edit your mountians? the rock stone dirt and ones? I made some tiles that didn't exist that would be needed for a complete bitmask set. Which mountains exactly? The set of mountains adapted from The Mana World by Saphy and Len Pabin (see attachment) are under the GPL v2 license. The others should all be available under CC-BY-SA 4.0. I really need to officially post these with attribution... I'll try to do that this week. I've finally submitted the mountain set here: https://opengameart.org/content/lpc-mountains . So macmanmatty, go ahead and use! Hi all, it's been a while; I submitted a few things, which anyone who cares probably saw: furniture https://opengameart.org/content/lpc-upholstery and upholstery https://opengameart.org/content/lpc-upholstery . Still need to go back and make a preview for those, but I was hoping to put together some indoor walls/floors first. Here's where I am with that... I'm not really satisfied with either yet, so if anybody has any suggestions, I'd be open to it. I also want to go back and do recolors on the full upholstery set, and maybe a few more for the wood (at least white paint). A related goal I have is to put together some knick-nacks or "clutter" objects to sit on top of the various furniture, both inside and outside. 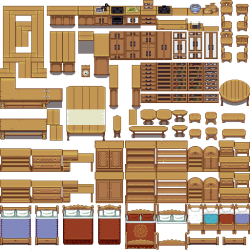 I'm thinking of theming these sets around rooms or trade; for instance, study/library, kitchen/dining, merchant, smith, tailor, scientist/chemist/alchemist/pharmacist, baker, etc. Let me know if you have ideas for these themes! I love you for this, bluecarrot. To this end, one project which has ballooned in scope, almost to the point of an unhealthy obsesion, is drawing some food items, starting with fruits and veggies. Again, the goal is not just to create items for inventory (although ideally they'd be usable for that too), but stuff that could appear as decorations on the map. 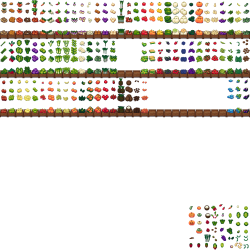 I started out with Joshua Taylor's fruit and veggie inventory items https://opengameart.org/content/fruit-and-veggie-inventory , resizing and in many cases redrawing them to be more in line with the LPC style. 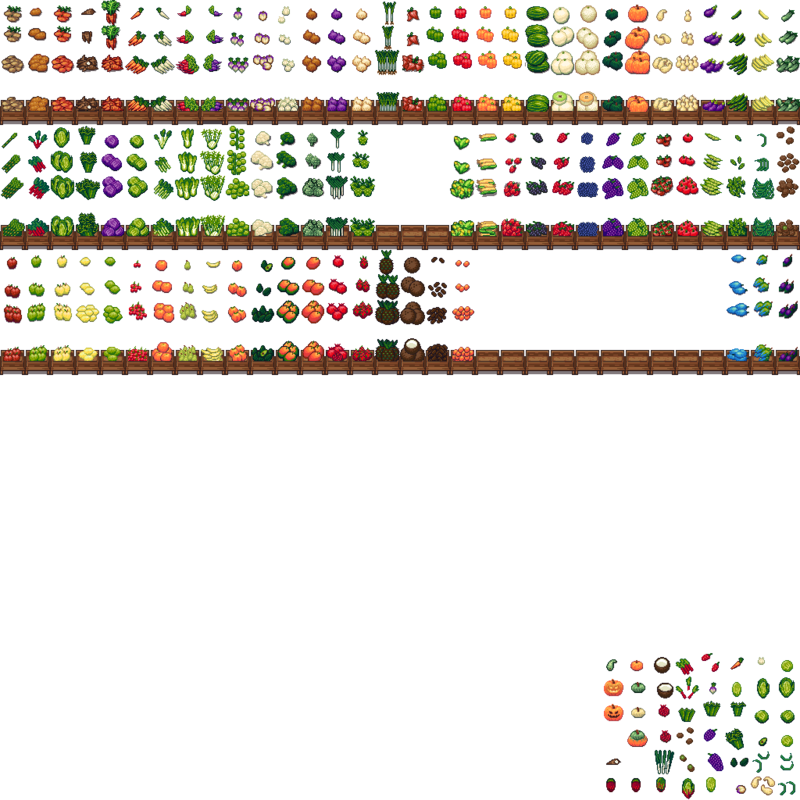 Then I arranged each one in a few quantities and combined with Daniel Eddeland's classic farming set: https://opengameart.org/content/lpc-farming-tilesets-magic-animations-an... . 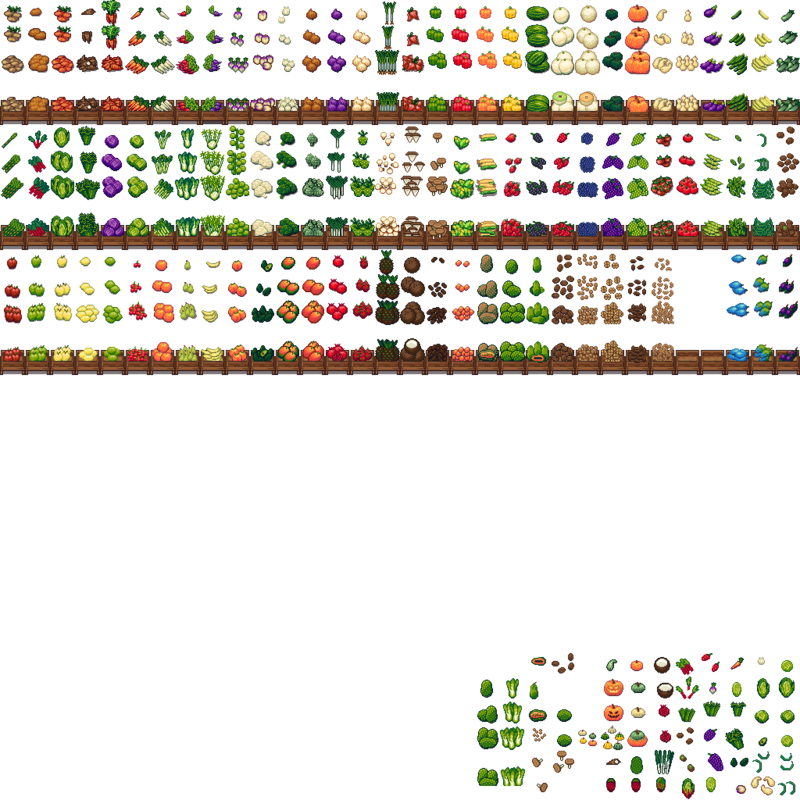 There are currently 83 different fruits and vegetable sprites---including a few duplicates from the two original sets that I kept because I liked them both, some recolors for common variants, some that I made from scratch or remixed from others, and a few mystery fruits from Joshua Taylor's original set (if anybody can identify them I'd appreciate it, but I think they're made up). It's actually been kind of fun and forced me to experiment with more colors; I've tried to keep a somewhat limited pallette, and some may disagree with the choice of some more saturated reds and yellows than the LPC palette contains, but I tried to compromise between palette purity and nice, appealing-looking produce. AAAAH! It's perfect for what I'm doing! Oh,well great haha!! Any ideas for what to put in the blank spaces? Will you be making trees for these too? . You could put quince, some kind of edible flower, peanuts, cashews, almonds, pecans, jackfruit, breadfruit, asian pears, or pruple cabbage. Cool ideas! What kind of edible flowers are common? I'll do the nuts; jackfruit and breadfruit are pretty different from anything else, but similar to each other, so should be easy. I feel like asian pears look too much like apples... same with quince (vs pears), although I guess I could make some more colors of pears. Purple cabbage is there already (under red cabbage)! I have no idea what kind of edible flowers people eat I do know high end restraunts serve them. Some people I know do eat squash blooms. Not sure that people eat them but passion flowers are nice looking . Patty pan squash would also be another interesting fruit. I have been working with produrally genereated trees where you have a trunk and leaf clusters and fruit clusters are drawn on to it. Using some. algorithms I came up with . The leafs I got down to look pretty good and in nice tree shapes. But fruit I could never get actually look like it was part of the tree. Either the leaves covered it up or looked like a 2d image drawn ver another 2d image and not like it was in the tree or gwoing on the tree. Still working on the fruit. I was using these leaves . I make any resources I can gray scale and then color them later usinga fragment shader to blend with a given color. Ben Ben "cliams" to have drawn them and says they are free to use. If you have links to any better looking leaves (or just different) or leaves you think would make nice trees please share them. I'll have to experiment with the fruit on the tree, but to look good they probably need to be partially covered by the leaves? yes to look good the fruit must be covered by leaves for the last two, you can always do dragon fruit and I think you need some plums. Dragonfruit is in there already (next to pineapple). But plums are a good idea! This is just amazing again, thanks a lot for putting so much effort into this!